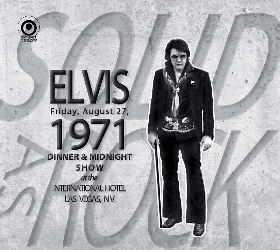 Elvis 'Solid As Rock' New Import CD: Straight Arrow is very pleased to bring you, as a first for the label, two concerts from 1971, the Las Vegas August 27th, 1971 dinner & midnight shows. And what a delight it is to get fresh tapes from this year, and from this season, and in rather decent sound too - a rarity for early Vegas seasons. The August 27th, 1971 Dinner and Midnight Shows are taken directly from an original Audience Recorded master tape. The Aug. 27, 1971 D/S is a completely new show, even for die-hard Elvis fans. It has never been in circulation - in any form! The Aug 27, 1971 M/S was previously released from an awful sounding source. Elvis' previous engagement there had shown clear signs of his high performing standard slipping, but here it sounds like he's back on track again. Both shows are tight, no-nonsense affairs with Presley in good voice and in strong form. He performs with focus and professionalism, and he sings a fantastic variety of music. It's interesting to note that already in '71, the difference between the dinner and midnight shows was becoming noticeable, the midnight show is truly sensational! This release is presented in a de-luxe double digipack, collection of photos taken in Del Webbs Sahara Tahoe hotel and at the Las Vegas.